A stranger enters the saloon. He wears a poncho and reminds me, presumably not accidentally, of Clint Eastwood in “Fistful of Dollars”. He goes past several dangerous gunmen, looks the barkeeper in the eye and then – asks if he’s allowed to play a little tune on his violin, please? You’re right, this isn’t exactly repeating what you’ve seen in a hundred other westerns before. 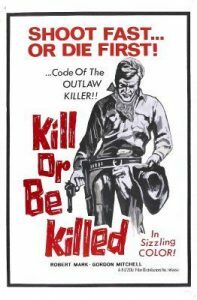 “Kill Or Die” is a well scripted, intelligent, but little known Italian western. The director handles matters a bit conservative, probably preferring American westerns of the 1950s to the Corbuccian close-up ugliness that was en vogue in 1967. Robert Mark plays the hero, Slovenian actor Andrea Bosic plays a very professional sheriff who is cautiously keeping an eye on all suspects, and Gordon Mitchell has a typical guest appearance as a killer in black, devoted to his job (“Where would you like to be buried?”) and using the trusted maniacal grin.